Breckenridge. Simply saying this one single word brings a flood of good memories of great times. The mountain. The trails. The hotel where I always stay. The town. The snow. City Market. Giampietro’s. Wow. Just writing about this makes me want to fly out there right now. I love and miss “Breck” dearly, as it’s affectionately known by the locals. Outdoor enthusiasts like me are drawn year round to Breck for its quiet tranquil beauty and abundant activities. Yes, Break has it all with its many hiking and biking trails, fly-fishing in the Blue River, boating in nearby Lake Dillon, and of course for its excellent skiing. Now entering its 51st season, the Breckenridge ski resort boasts a summit elevation of 12,998 feet and offers over 2,350 acres of ski and snowboarding trails across four peaks on the Ten Mile Range of the Rocky Mountains. Groomed daily, there are 155 trails with Four O’Clock trail the longest at 3.5 miles, 772 skiable acres in the back bowls, and 25 acres in the terrain parks for borders. The total lift capacity is 37,880 skiers per hour with 31 total lifts, including two high-speed 6-passenger SuperChairs, seven high-speed quad lifts, one triple lift, six double lifts, one 8-passenger gondola, five surface lifts, and nine carpet lifts. Lift hours of operation on the mountain is typically from 8:30 a.m. to 4:00 p.m. with the BreckConnect gondola (named by a friend of mine in a naming contest!) open from 8:00 a.m. to 5:00 p.m. daily. Breck already has snow as I write this, with opening day just over a month away on Friday, November 9, 2012. If you buy your lift tickets now and before November 16, you can get the 2011/2012 season prices. An adult one-day pass is $67, going up to $76 in mid-November to even increasingly higher costs in late November, December and January when it finally peaks in price. Seasonal passes are available with deep discounts given to those living in Colorado. The 2012/2013 ski season for Breckenridge will close after April 14, 2013, weather permitting. Now let’s not forget the town of Breckenridge! Named after former Vice President of the United States, John C. Breckinridge, this charming town offers its residents and visitors many restaurants and shops to explore, in addition to theatre, comedy clubs, and hands-on crafts such as pottery painting. There are festivals held year round, such as the Snow Sculpture Championships and the Ullr Fest parade in the winter and the Breckenridge Festival of Film and Jazz Festival in the summer. Plus historical tours, train and boat rides, cycling races, and more. The charming old mining town is also the county seat of Summit County, home of several other excellent ski resorts, including Keystone, Copper and A-Basin, only a short drive away. So if you are thinking of taking a winter ski trip this year, may it be a romantic getaway for two or a fun family vacation, escape to Breckenridge in Colorado and discover world-class skiing, breathtaking surroundings and an authentic Old West town rich in history. Your adventure awaits you! Accommodations: Beaver Run Resort and Conference Center, Breckenridge, 620 Village Road, Breckenridge, CO 80424 (970) 453-6000 http://www.beaverrun.com/ for ski-in ski-out access to the Beaver Run Super Chair and the Quicksilver Six chairlifts. Mountain Thunder Lodge, 50 Mountain Thunder Drive, Breckenridge, CO 80424 (970) 547-5650 http://www.breckresorts.com/mountain-thunder-lodge.aspx for cosmopolitan luxury, in a rustic mountain setting. Book early! 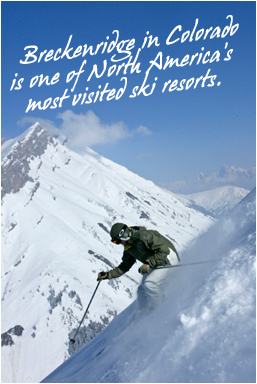 Onsite Activities: Beaver Run Resort: ski-in ski-out for downhill skiing and snowboarding, spa, gym, swimming, dinning. Mountain Thunder Lodge: Ski-in / Gondola-out for downhill skiing and snowboarding, gym, swimming, bowling alley, movie lounges, game room, dinning. Nearby Activities: WINTER – carriage rides, cross-country skiing, ice skating, Nordic skiing, skiing, sledding, snow sculpture contests, snow kiting, snowboarding, snowmobiling, snowshoeing, dog sledding, sleigh rides, tubing; SUMMER – whitewater rafting, hiking, fishing, horseback hiding, biking, triathlons, golf, boat rentals and tours, hot air balloon rides, jeep adventure rides, music festivals, fun park. Getting There: Breckenridge is located two hours (104 miles) from the Denver International Airport (DEN) with easy access from I-70. All major car rentals are available at the airport as well as shuttle service to Breckenridge. Additional airport options include Eagle County Regional Airport (EGE), about 63 miles away, and Colorado Springs Airport (COS), 110 miles from Breckenridge. Special Note: Hands down the BEST PIZZA EVER is served at Giampietro Pasta and Pizzeria! Voted by the locals as the “Best Pizza in Summit County” for the past eight years, Giampietro’s has been making its popular New York and Sicilian-style pizzas and Italian dishes for well over 10 years. Everything is homemade and incredibly delicious from their classic baked ziti to spaghetti with shrimp and pesto. You can also build your own calzone or pizza from their huge list of ingredients. Get there early to get a table or be prepared to wait! Giampietro Pasta and Pizzeria, 100 N Main Street, # 212, Breckenridge, CO 80424 (970) 453-3838 http://giampietropizza.com/. 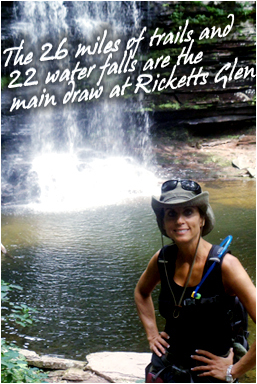 One of my favorite types of hike is one that includes water views – creeks, ponds, lakes and best of all, waterfalls. So when close friends of mine started discussing a possible trip to Ricketts Glen State Park last summer, I immediately jumped at the chance to go! What hiker wouldn’t want to explore the National Natural Landmark known best for its old growth timber and 22 wild, free-flowing waterfalls, including the 94-foot Ganoga Falls, along Kitchen Creek which flows down the Allegheny Front escarpment from the Allegheny Plateau to the Ridge and Valley Appalachians? Yes, Ricketts Glen State Park is one of the most scenic areas in Pennsylvania, a breathtaking park comprised of 13,050 acres in Luzerne, Sullivan and Columbia counties. Before grabbing your gear, packing up and heading out to Ricketts Glen, you should first reserve a campsite as far in advance as possible if you are planning to stay in the park. Both tent and trailer sites are available plus cabins with the waterfront locations along the 245-acre Lake Jean the first to go. The park also offers all the necessary amenities needed for your home away from home – such as fire pits, picnic tables, warm showers, rest rooms, and wash tubs to clean your dishes – all including in your nightly cost. Please be aware that Ricketts Glen has limited cell phone coverage which actually can be an added plus! Now that you are there, venture out to explore 26 miles of trails, from fairly level to very steep. My favorite is the 7.2 mile Falls Trail which takes you by 22 beautiful waterfalls ranging in heights from 11 feet to 94 feet. While the terrain is rocky and can be slippery as you descend and ascend the winding path, the scenery is well worth the endeavor! Be certain to wear proper footwear and bring your hydration pack.Other hiking trails include the Beach Trail, Cherry Run Trail, Evergreen Trail, Ganoga View Trail, Grand View Trail, Highland Trail, Mountain Springs Trail, Old Beaver Dam Road Trail, Old Bulldozer Road Trail, and the Bear Walk Trail. After hiking, you can relax on the 600-foot beach on Lake Jean or take a swim. Pack a bite to eat or grab a snack from the food and refreshment concession. Rent a canoe, kayak, row boat, and paddle boat at the beach if you didn’t bring your own. Fishing is allowed with panfish, trout and bass ready to be caught. There is also a 12.5-mile equine trail for those who bring their horse. What is especially nice are the nights at Ricketts Glen. All who have traveled together join together to grill a scrumptious meal as they gather around the fire pit and give a toast to the enjoyable day! Getting out into the woods and being close to nature is a wonderful experience. Turning off your cell while camping under the stars, gliding on a lake, and hiking by breathtaking waterfalls is rejuvenating. If the opportunity arises, I recommend taking action for a fit and fun getaway. Accommodations:There are 120 tent and trailer campsites, some available year-round – all inexpensive. The campground features hot showers, flush toilets, shaded sites, gravel parking spurs and a sanitary dump station if you are planning to pitch a tent. Six campsites are ADA accessible. Pets are permitted on several designated sites. Book early to get a pet site or waterfront with lake access! Onsite Activities: Camping, hiking, kayaking/canoeing, boating (electric motors only), beach access, swimming, horseback riding, fishing, hunting, cross-country skiing, snowmobiling, and park activities such as scavenger hunts plus presentations and shows in the onsite amphitheatre. Nearby Activities: SUMMER – Adventure courses, air tours, boating, ATVs, bird watching, canoeing, casino, concerts, cycling, fairs and festivals, fishing, golf, hiking, horseback riding, hunting, kayaking, miniature golf, mountain biking, museums, paintball, race car experience, racetracks, river rafting, rock climbing, sailing, shooting range, shopping, skydiving, spas, tennis, train tours, trolley tours, tubing, water parks, waterskiing, wildlife viewing, winery tours and zip-lining. WINTER – Casino, concerts, cross-country skiing, dog sledding, downhill skiing, horse drawn sleigh rides, horseback riding, ice climbing, ice fishing, ice skating, museums, shopping, snowboarding, snowmobiling, snowshoeing, snow tubing, and spas. Getting There:Your best bet is driving. The park is 30 miles north of Bloomsburg, Pennsylvania on PA 487 in Benton; a three hour drive from Philadelphia or New York City and a four hour drive from Pittsburgh. Flying in from across the country? Car rentals are readily available at the Wilkes-Barre/Scranton International and Williamsport Regional Airports, each an hour from the park, and Lehigh Valley International and University Park Airports, both a two hour drive away. Special Note: A must place to eat breakfast is the Red Rooster Pancake House and Family Restaurant, only a short drive from the park. With a homey atmosphere, everything on the menu is very reasonably priced, service is great, and the menu is extensive. Try the pumpkin nut pancakes. They are out of this world! When Packing Your Bags, Pack Your Sneaks! Staying fit and healthy is a lifelong commitment. It entails being faithful to your workout regimen, maintaining a healthy diet, and living the other cardinal rules of living fit and well, including getting enough nightly sleep, taking care of your skin, flossing and other healthy practices. Being fit and healthy knows no breaks other than your normal days off from your working and a sweet treat on occasion. Getting on a plane, train, or automobile to take you to a different destination other than your home is not a reason or excuse NOT to keep your commitments to yourself. If anything, it’s an opportunity to change up your workout and diet which should be exciting and enticing! When traveling, I always try to stay at a hotel that has a gym. Most hotels and resorts have fitness rooms to continue your workouts. They may not be like your gym back home, but it’s enough to get you by. If your hotel does not have one, there are often nearby gyms that may even offer discounts to hotel guests. Check with your hotel when checking in. After registering, one of the first things I do after dropping my bags in the rooms is to check the gym and ask about the hours. If I am traveling for business, then often I have to get creative when I’m going to get my workouts in. If it’s for pleasure, I typically go early in the mornings just as I do when at home. If you don’t have access to a gym while traveling, then pack along a few pieces of portable equipment, such as a jump rope, resistance bands, and even exercise DVDs if you have a laptop. Exercise wise, you should also be able to perform several in your hotel room, including lunges and squats to keep your quads, glutes, and hamstrings in shape; pushups, sit-ups, leg raises, and side planks for your arms and ab; and dips using a chair for your tris. Traveling can sometimes play havoc with your healthy eating. From the airport and airplane food to hotel and restaurant meals, it’s easy to be VERY tempted and fall off course. So be prepared to remain discipline and don’t lose what you’ve worked so hard to achieve! Keep making your healthy eating choices. Look at this as a great opportunity to continue with your diet by trying different healthy recipes from eateries. Also, pack some of your favorite healthy snacks. I always do this, in addition to my vitamins. Mixed nuts, raisins, and granola/power bars are easy to take along. I also often bring grapes that I nibble on during the first day and a bottle of water to stay hydrated. Often a getaway is an opportunity for new or different physical activities. Put it in this light and it can be another incentive for your getaway. It can be as simple as walking around a great city, rock climbing at a national park, trying surf lessons for the first time, or cycling around to see the new sights. So get out there and remain fit, active, and healthy. Eat well by making wise meal decisions and enjoy your days away. 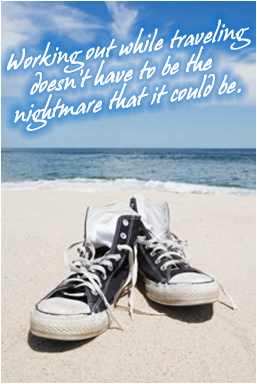 And remember to pack your sneaks!